We have our first look and plot details from the upcoming Conjuring spin-off, The Nun. During this modern, mainstream horror resurgence we've seen in recent years, Warner Bros. and New Line have largely been leading the pack and much of that has to do with The Conjuring universe of movies. 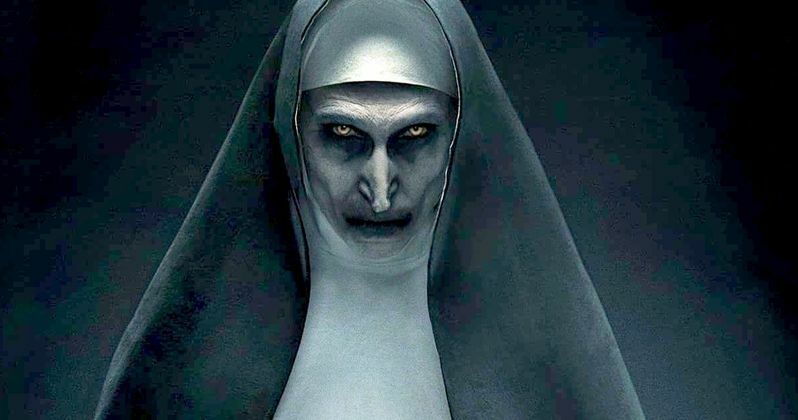 This year, they're continuing their string of spin-offs with The Nun, which centers on the demon nun Valak first featured in The Conjuring 2. Now, we have our first image of the character, as well as a synopsis for the upcoming movie. The image is simple yet effectively terrifying, even if you didn't see The Conjuring 2. There is a smokey black and white background, with Valak, played once again by Bonnie Aarons, front-and-center. The demon is in otherwise inconspicuous and typical nun garb, which is why seeing the evil force lurking underneath is so unsettling. As for the plot of The Nun, it was previously revealed, via a post-credits scene in Annabelle: Creation, that the movie will take place in the 1950s. Beyond that, it sounds like things are going to get pretty dark with this one. Here's the newly revealed synopsis. "When a young nun at a cloistered abbey in Romania takes her own life, a priest with a haunted past and a novitiate on the threshold of her final vows are sent by the Vatican to investigate. Together they uncover the order's unholy secret. Risking not only their lives but their faith and their very souls, they confront a malevolent force in the form of the same demonic nun that first terrorized audiences in The Conjuring 2, as the abbey becomes a horrific battleground between the living and the damned." The Nun comes from director Corin Hardy (The Hallow), with a cast that includes Demian Bichir, Taissa Farmiga, Jonas Bloquet, Charlotte Hope and Ingrid Bisu. The movie wrapped production last June. At the time, the studio intended to release the spin-off right in the heart of the summer season on July 13 this year. Instead, they decided to bump the release to September 7. That release date not only has less direct competition, but this is also the same timeframe in which they released IT last year, which wound up becoming the highest-grossing horror movie ever. So they have reason to think that early September is a good time for horror, assuming the movie is any good. So far, save for the first Annabelle, quality hasn't really been an issue for The Conjuring movies, which have helped push the franchise to an impressive $1.2 billion at the worldwide box office. So there's no real reason to think that The Nun is going to be any different. Given that the movie is set to arrive in September, it's very likely we'll be seeing a teaser trailer in the very near future. We'll be sure to keep you up to date on that but, in the meantime, be sure to check out the first image from The Nun for yourself below. This news was first reported by Bloody Disgusting. Still haven't sleep ah? OK no need sleep anymore.